In theory, my roommate and I are big fans of fresh ingredients and healthy eating. But the grocery store is far away, the checkout line is always long, and lugging the food back to our apartment is the last thing we want to do after a long day at work. We order in, or pick up a sandwich from the local deli, or when we’re really exhausted, we swap dinner out for whatever snacks we have left in the pantry - not exactly living our best selves. And then we heard about Blue Apron. 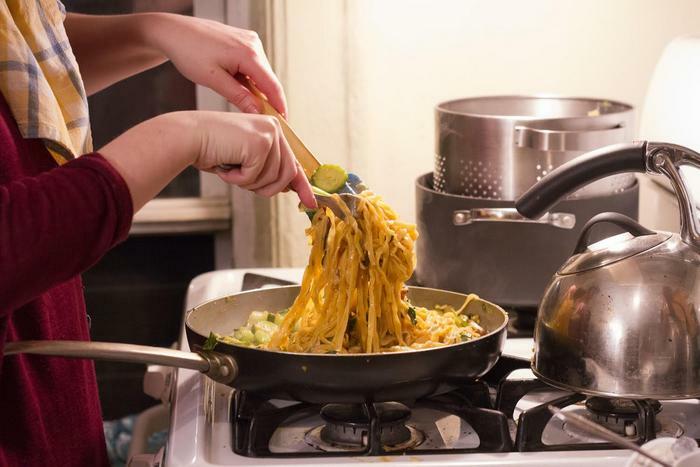 Blue Apron dares you to ditch the take-out menu and cook up something delicious. 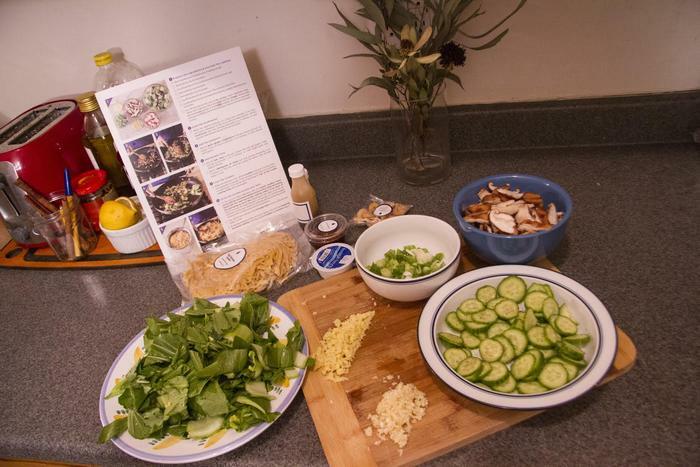 They deliver fresh ingredients to your doorstep, along with step-by-step recipes, making it easy to create a tasty meal. It appealed to our desire to know exactly what goes into our food, to learn something new in the kitchen - and we hoped it would bring back that love for cooking we had before our 9-5 took away most of our down time. We decided to give the 3-day special and try (and you can too btw! Click here to get $30 off). The variety of meal plans made it easy to pick the perfect one for us. We chose the 2-person plan for $59/week (they also offer a plan for 4-6 people for $69/week). New recipes are posted on the website every week. My roommate, Fletch, and I finally decided on Wonton Noodle Stir Fry (vegetarian), Tandoori Style Chicken, and Cajun Catfish. A week later, the Blue Apron box was waiting for us when we got home. It was cold to the touch, which we later found out was from the ice packs keeping the ingredients chilled and fresh. Unpacking the box and seeing the abundance of fresh herbs, produce, chicken and fish had the foodies inside of us screaming with excitement and we couldn’t wait to start cooking. All ingredients were fresh and perfectly proportioned - which saves you from a stinky vegetable drawer with wilting broccoli and the terrible feeling of throwing food away. The chicken and fish were in vacuum sealed packages which came in handy when we had to change plans around and cook a recipe a few days later than expected! When Cooking Becomes a Fun Science Experiment Instead of a Chore. We started out a bit skeptical as to how easy this whole thing was going to be. The Wonton Noodle Stir Fry put a fresh spin on my usual stir-fry routine, which includes throwing anything in the fridge into a pan with soy sauce and hoping for the best. The noodles were soft and dusted with flour, and there ended up being enough leftovers to take to work the next day. Tandoori style Chicken and zucchini rice was probably the most complicated recipe, demanding that you cook with multiple pans and the oven at the same time. But the instructions, particularly the timing, got us through to a shockingly authentic tasting Indian-style meal. This was a crowd favorite amongst our neighbors, too, who enjoyed the spices wafting in the hallway. Since neither Fletch nor I are used to cooking fish, Cajun Catfish was the most intimidating recipe and we saved it for last. The fear, however, was unwarranted and the recipe got us through without a single hiccup. Stirring purple cabbage with a dollop of mayo and spring apples? No problem. Covering catfish in a mix of flour and spices after patting it dry? We’ve got this. While a warm and spicy catfish simmered on our stove, I thought of the Julia Child Quote “If one can read, one can cook”. 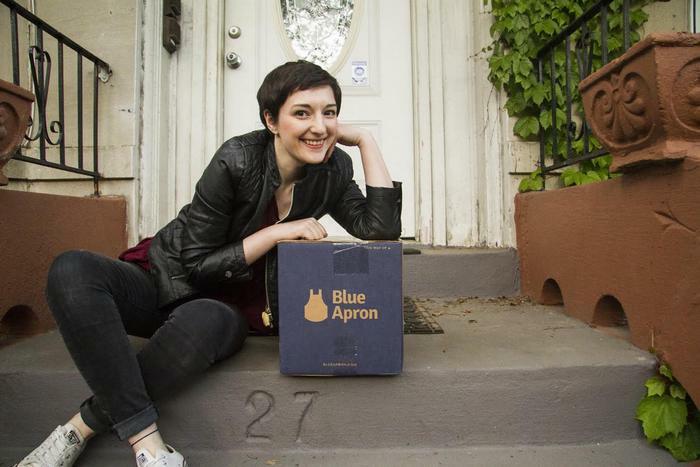 Blue Apron exemplifies the famous chef’s theory, and spreads the joy of cooking that she lived for.